Near the closed town of Concarneau. 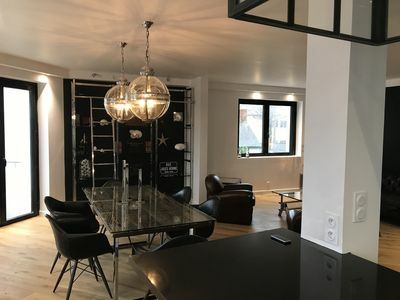 Open all year, you will enjoy a breathtaking view of the port of Concarneau and the closed city, in the heart of the city center you will be close to shops and its beaches. Ideally located this apartment is an invitation to the journey and the imagination of Jules Verne, in Duplex it benefits from a south-west facing terrace of 80m2. A large living room of 45 m2, composed of a large open kitchen and perfectly equipped with a cozy seating area and a dining area overlooking a small balcony, you can admire the closed city at all hours of The day and the tides.